Another guest post of Jessica Davies for the diva challenge. 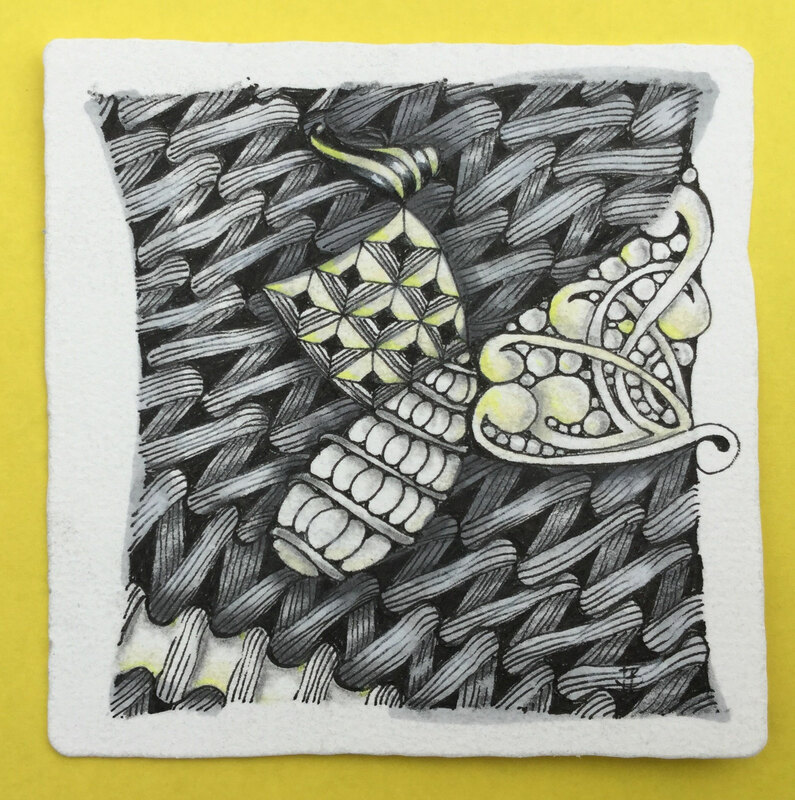 This time it's about the tangle peanuckle - often avoided, because it's not as easily accessible as others. ... die Herausforderung lag diesmal für mich an ganz anderer Stelle: Ich hatte mit einem blinden String begonnen (mit geschlossenen Augen gezeichnet). Daraus entstand das "Objekt". Peanuckle sollte den großflächigen Hintergrund bilden. Das aber führte dazu, dass der Hindergrund richtig dunkel werden musste. Ich habe erstmals mit Markern schattiert und mit Bleistift und dann wieder mit weiß aufgehellt und wieder Bleistift.... So heftig schattiert habe ich noch nie. Am Ende brauchte es dann etwas Farbe, um die Düsternis erträglich zu machen. ... the challenge for me this week was shading! 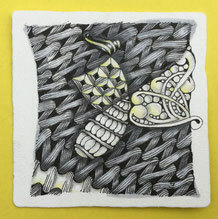 I had started my tile with a bling string - drawn with closed eyes. That's how the "object" came into being. Peanuckle was ment to fill the big area in the background. As it turned out, the background had to become really dark to make my object pop out. So I used markers for shading - first time ever! I darkended the whole space, then more pencil, white chalk for some highlights, pencil again.... I never did so heavy shading before. In the end some yellow was needed to ward off depression. And some more graphite.... Hard work! Nach sehr viel Herumgedrehe, habe ich mich entschieden, die Kachel in dieser Ausrichtung zu zeigen. Ich empfinde bei dieser Position der Kachel sehr viel Energie und Bewegung nach unten. "Abtauchen in tubulentem Wasser mit wehender Flosse" denke ich da - Ostseetaucherin wie ich bin. Ich glaube, wirklich schön finde ich diese Kachel nicht - aber der Prozess war super spannend mit viel Neuland. Und das allein zählt! After much turning around I decided to show the tile in this direction. This way I feel a huge downward movement and energy. "Diving down into turbulent waters with a waving fin". That's what I feel, when I look at it - Baltic-Sea-diver as I am. I don't think I really like this tile. It's not pretty. But the process of tangling was super exciting and interesting with some new territory to be entered. And that's all that counts! Beautiful! You have such a creative zig zag effect with your peanuckle. I can see how it's one you use often. Thanks for participating in the Diva Challenge this week! Very refreshing to read that someone actually likes Peanuckle. Brains seem to be wired differently and some tangles are so difficult for some and easy for others. I really like how yours turned out! I think you are the first one (that I read) saying that you like Peanuckle. I envy you! I think you did great with Peanuckle. They all look great, along with the other tangles. Your Peanuckle looks great! I am one of those avoiding it! You make it flow! Finally someone else that likes Pea-nuckle. I think you did well with it. I think that shading this tangle is difficult. I usually do not do much. I like your highlights. Pea-nuckle lovers UNITE! !